Knowing how to calibrate the Mavic Pro vision sensor is very important. If the vision system error on your Mavic Pro appears, then calibration may fix the problem. Also, if you are flying your Mavic Pro and the vision system error occurs, you need to fly the quadcopter back to you straight away. Below we have instructions on the Mavic Pro vision sensor calibration process, along with notes and videos. 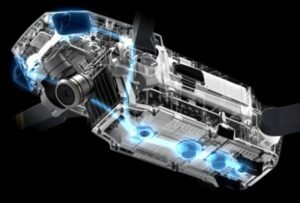 There is also terrific information on the Mavic Pro Vision Positioning system. Very importantly, there are some top tips on how to resolve the vision system error on the Mavic. The Mavic Pro uses the GPS, Forward and Downward vision sensors to locate itself, automatically stabilize and navigate between obstacles. The vision sensors feed essential data back to the flight controller which then responds by issuing automatic commands to avoid or hover in front of the obstacle. If the Mavic Vision Positioning System isn’t working correctly or not at all, then there is a real possibility that the Mavic will crash. The Mavic Pro Vision sensors also work in the autonomous modes such as TapFly and Gesture mode. In Gesture Mode, the Mavic Vision System recognizes gestures, allowing it to follow and capture selfies without the need for a phone or controller. So Gesture mode won’t work if their is problems with the Mavic vision system. It must be noted that the Forward And Downward Mavic Vision System is made up of both vision and ultrasonic sensors. The steps below show you how to calibrate the vision sensors which are on the front and bottom of the Mavic Pro. This won’t calibrate the ultrasonic sensors which are on the bottom. However, there is terrific information on troubleshooting the whole Mavic VPS and system error further down this article. Some are very simple steps and you can do these before calibrating the vision sensors on the Mavic. If you have the latest Mavic 2 Pro or Zoom, then you visit our Mavic 2 vision calibration article as there are differences in the Mavic Pro and Mavic 2 vision system calibration. Install DJI Assistant 2 software on your computer or laptop. Make sure your laptop and Mavic Pro batteries have a minimum of 50% charge but better if fully charged. Carefully remove the propellers from your Mavic Pro. Connect the Mavic Pro to your laptop computer using the USB cable. Switch on the Mavic quadcopter and open the DJI Assistant 2 software. The DJI Assistant software will recognize that the Mavic Pro is connected. Select your Mavic Pro drone and click on “Calibration” on the left hand side. The next window shows you the steps involved with calibrating the Mavic VPS. Next, click on the “Start Calibration” on the bottom right hand side. Point the forward facing Mavic Pro vision sensors towards the screen. Now the green and red squares have to match so you may have to move the Mavic Pro forward towards the screen and back towards you to get them to match. Once the Mavic is in the correct position, the corners of the square will turn blue. You calibrate the vision sensors by moving the quadcopter so as to line up the corners of the blue square to coincide with the blue boxes. Tilt and rotate the Mavic Pro following the blue square on screen. Once this Phase 1 is complete, you will be prompted to move the aircraft away from the screen. Next, you will have to follow the little squares around the screen again. This will complete the Mavic Pro forward facing vision sensors. The next steps is to calibrate the Mavic Pro downward facing vision sensors. Point the under side of the Mavic Pro at the screen with the front of the Mavic pointing upwards. Again, you need to have 4 blue corners so you may need to move the Mavic closer or further back from the screen. Calibrate the bottom Mavic Pro vision sensors by matching the blue corners with the blue box following it around the screen. Again, during this process you will be prompted to move the Mavic Pro away from the screen. Then follow the blue square around the screen which is the last stage. On completion of the Mavic vision sensor calibration, the DJI Assistant 2 software will automatically calculate, apply and save the VPS calibration settings. When calibration is successful, it will show 100% and a message “Calibration Complete”. Insure that you have the latest Mavic Pro firmware before calibrating the vision sensors. Remove the propellers before starting the calibration. It is best to have batteries full or as close to full on your laptop and Mavic Pro just in case the vision sensor calibration takes longer. Give yourself plenty of space and have no interruptions while you calibrate the Mavic Pro vision sensors. Calibration the Mavic Pro vision sensors require more or less only wrist movement to pivot, tilt and rotate the drone and following the blue squares on the screen. Insure you fingers aren’t covering or close to the vision sensors while calibrating the Mavic Pro. Leave the Mavic Pro on during the full process until you see the “Calibration Complete” message. It is possible to do a quick calibration of the Mavic Pro vision sensors. This could be a quick fix if you receive the DJI Mavic vision system error while out aerial filming or if you feel the obstacle detection system isn’t working correctly. If you don’t have a laptop with the DJI Assistant 2 app to do a full Mavic vision sensor calibration, then you can do a quick Mavic vision sensor calibration using the DJI Go 4 app. To do the quick Mavic vision calibration, tap on the Aircraft Status in the DJI Go 4 app. Then click on Vision Sensors and start the quick calibration. The Mavic Pro is equipped with a Forward and a Downward Vision System which constantly scans for obstacles in front of it, allowing the Mavic Pro to avoid collision by going around, over or just hovering. The forward vision sensor are on the front of the Mavic Pro, almost like eyes. The downward vision system use both ultrasonic and vision sensors along with image data to help the aircraft maintain its current position. The main components of the Forward and Downward Vision System include 4 monocular sensors and 2 ultrasonic sensors. The Mavic Pro visions sensors don’t work in S-Mode (Sports Mode) which is something to be mindful off. In Failsafe Return-To-Home, the Mavic can avoid obstacles. However, you must remember that the Mavic cannot return to home or avoid obstacles if the GPS signal is weak, unavailable or if the lighting is insufficient. Here is another terrific article which explains everything about collision avoidance sensors on drone. The Mavic vision system error does not have to be coming from the vision sensors. It could in fact be caused by the ultrasonic sensors which are part of the whole Mavic Vision Positioning System. So the process of calibrating the vision sensors would not work if the problem is with the ultrasonic sensors. If you’re quadcopter is only new and you are receiving the Mavic vision system error, it is important to troubleshoot the problem as quickly as possible. With new DJI products, there is always the option to return the quadcopter but this return period is not very long. However, don’t send it straight back without checking the below and following the below steps as it could be something very simple causing the Mavic vision system error. Here are some instructions on what to try when you receive the DJI Mavic Vision system error. If the Mavic is only new, check to make sure there is no tape or packaging covering either the forward and downward vision sensors. Switch off the Mavic Pro, take the battery out and leave it off for about 2 minutes. If the light is insufficient or flying over certain surfaces can cause the vision sensor system error. See below. Ensure the vision sensors are clean. Use a soft cloth to remove any dust or debris from the sensors. Check other parts of your Mavic Pro. If the quadcopter isn’t flying correctly because of bent or broken propellers, then incorrect information will be sent back to the flight controller which could lead to the to the system error. Check to make sure you are on the latest firmware and if not, then update immediately. Calibrate the Mavic Pro vision sensors using DJI Assistant 2 software described above. Check that you are getting a strong GPS signal in P-Mode. Calibrate the Mavic compass. If the compass is not calibrated, the flight control system is not receiving correct information and this may effect the vision system. As well as vision sensor issues, you may be having issues where the Mavic disconnects from the Remote Control or DJI Go 4 app. If you are experiencing this, then read our article on fixing Mavic Pro disconnects. 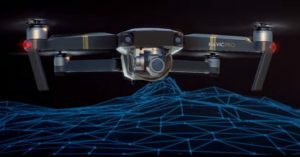 The Mavic Vision System is affected by its surroundings with the ultrasonic sensor under the Mavic been affected greatly by the surfaces it is being flown over. Never user other ultrasonic devices which have a frequency of 40 KHz near the Mavic when the Vision System is on. Note: View this large selection of Mavic Pro parts, upgrades and accessories here. This includes all the parts such as batteries, chargers, propellers, lens filters, carry cases, DJI goggles for your Mavic and much more. Here is a terrific video which takes you step by step through the Mavic Pro vision sensor calibration which was described above.